GB Patch's newest release, XOXO Droplets, sought to capture the self-involved, angst-filled, hormone-fueled dating scene of high school, and it succeeded. The biggest blunder of the gaming industry is its inability to accurately capture and re-create the dating scene of being a junior in high school; the industry has attempted again and again, and failed again and again... until now. At the start, after making the difficult and important decision of the color of your ribbon, you carefully choose your first and last names. You first meet Lynn, the school nurse with whom you promptly and persistently flirt as you learn a little bit about yourself and your goals for the school year: apparently, your self-named protagonist is a loveable, boy-crazy high school girl who is unashamedly seeking out a boyfriend. Nothing is too out-of-the-ordinary -- until you get deeper into the dialog. On GB Patch’s homepage, they write, “We’re striving to create a memorable game library that is not limited to just one type of tone,” and indeed, the variety is quickly apparent. You’re treated to many humorous and rude conversations between the protagonist and, well, everyone. Unlike any other dating simulator that I’ve played, the main character isn’t a charming yet shy new kid to the school who sheepishly works their way into the hearts of each potential lover. No. Our hero is attitude-heavy, self-absorbed, blunt, and for lack of a better term, thirsty: a quality which distinguishes this title in a memorable sense. Now with more angst and hormones! 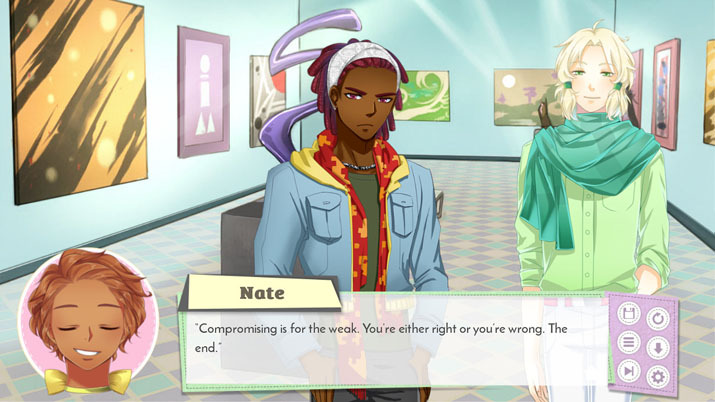 The core of the gameplay involves balancing your energy, indicated by pretty flowers and their petals; navigating the complex personalities and cliques, trying to be loved by everyone; and, ultimately, trying to find yourself a boyfriend. Where XOXO Droplets shines is in its unique character design. Each potential boyfriend represents one of the many stereotypes of jerks in high school, and they all share a heightened sense of self-importance. 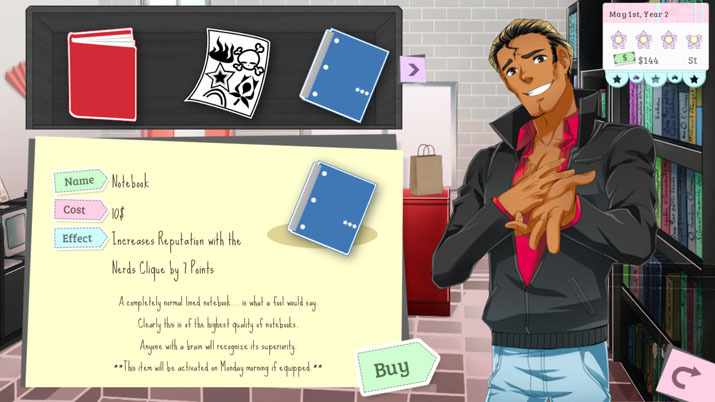 The interactions between you and the highschool heartthrobs are entertaining and give life to this release. You find yourself balancing your social life, work life, and romantic life without all the exhaustion of the real world. On top of searching for that romantic connection, you are also trying to stay in good terms will all the different cliques. From the popular kids to the troublemakers, the jocks to the nerds, you must choose with whom to chat after classes, and with whom to sit at lunch. Each decision rockets you into favor with one group while diminishing the favor of another. GB Patch captured the stereotypically shallow relationships of high school, but with even more angst and hormones. Since XOXO Droplets is hybrid between a dating simulator and a visual novel, there is a huge emphasis in the dialog and storytelling. Some interactions are only a couple sentences between a counterpart -- others consist of multiple characters, and pages worth of dialog. The bold choice to make the characters all jerks pays off in most cases. But after a while, the conversations seem to lose the ability to keep your attention, and you may find yourself clicking a mouse breaking speeds to get through your weekly group meeting. The main characters are ridiculous and humorous, but the other characters felt more like faceless extras, leaving it feel a bit empty. Within each clique you will find about ten individual students with whom you have your own personal reputation to manage, and each has their own ‘enemy' clique. Unfortunately, the other students are nothing more than names, with no face or art to distinguish between them, which makes saying “Hi” to Guang, while ignoring Jess, a little uneventful. Your quest to quench your thirst while maintaining good relations with every other student gave me a great laugh, though occasionally I sped through some of the more monotonous parts of the game. On the surface, there is a lot to look at and dive into. Between the bunch of boys, to the mall at which you can shop, to the jobs you can work, it seems like there would be more variety to each choice, but I found each decision feeling trivial and shallow; the repetitive nature of some of the conversations exacerbated this and, over time, XOXO Droplets lose its shine. However, the jerk characters of XOXO Droplets promises to entertain.